Rolf Armstrong - "Come And Get It!" This is a pristine example of one of Rolf Armstrong's series of cowgirl images created for the Brown and Bigelow Calendar Company, titled "Come And Get It! ", and "Soup's On!". The model for this series was Jewel Flowers. 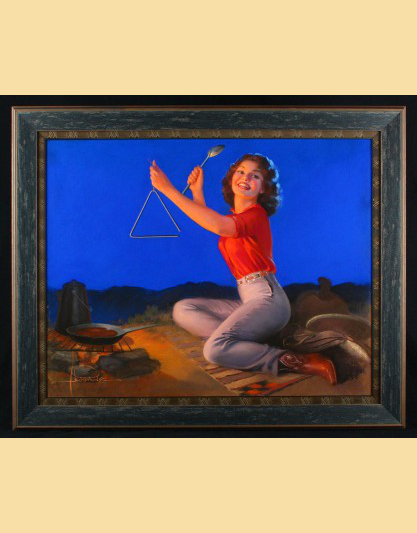 The electric blue night sky against the campfire makes this painting come alive, as Jewel rings the dinner bell. This painting is pastel on illustration board. Rolf Armstrong was born in 1889 in Bay City, Michigan and settled in Bayside, New York on the shore of Little Neck Bay, while keeping his studio in Manhattan. His interest in art developed shortly after his family moved to Detroit in 1899. His earlier works are primarily 'macho sketches of boxers, sailors, and cowboys. Armstrong had previously been a professional boxer and accomplished seaman, and the ruggedly handsome artist was seldom seen without his yachting cap. He continued to sail his entire life and could be found sailing with movie stars such as James Cagney when the Armstrongs were in California. Armstrong left Detroit to attend the Art Institute of Chicago. From there, he moved to New York and magazine covers became his primary focus. His first was in 1912 for Judge magazine. He later created artwork for advertisements, calendars, and sheet music. He made contributions to periodicals such as College Humor, Life, and Shrine Magazine. He became noted for his portraits of silent film and motion picture stars as well as pin-ups and magazine covers. By 1927, Armstrong was the most popular and bestselling calendar artist at Brown and Bigelow. As the 1930’s began, Armstrong was working with everyone, from the Thomas D. Murphy Company, to RCA. Everyone loved the spirited, colorful and often sporty “Armstrong Girls”. The wealth he accumulated through these high profile commissions, afforded Armstrong a mansion of his own, in Little Neck Bay, Long Island. There, on his beach and in the sun, he would paint his models. But in the mid 1930's he met Jewel Flowers, his "perfect dream-come-true model. It’s interesting to note that in later life, Rolf Armstrong adopted her. He spent the remainder of the 1930’s in Hollywood, returning back to New York, by the decades end. As WW2 began, artists of talent were volunteering and being employed in various patriotic campaigns. In 1949, Armstrong was amongst the very best, when he was asked to attend a War Advertising Conference with Earl Moran and Norman Rockwell. It was during this conference, that a member of the press asked Armstrong why he insisted on the use of a live model, now that photographs we so often used. Armstrong’s response came without pause and Jewel Flowers was smiling at his side: "When I paint, I want the living person in front of me. As I look at her again and again and again while I work, I get a thousand fresh, vivid impressions... all the glow, exuberance, and spontaneous joy that leaps from a young and happy heart." Armstrong moved to Hawaii in 1959 after his retirement from painting years before. He died in February 1960.